If there’s one thing 24 fans know, it’s that things don’t always go as planned. And that was certainly the case for the debut of 24: Legacy, Fox’s reboot of its game-changing series 24, after Super Bowl LI. Of course the Super Bowl would go into a first-ever overtime, pushing 24: Legacy’s well-timed promotional premiere way later than intended. Those on the East Coast who waited it out, however, got a heck of a reward in Corey Hawkins. Best known for playing superproducer and music mogul Dr. Dre in 2015’s box-office smash N.W.A biopic, Straight Outta Compton, Hawkins steps into the shoes of the Jack Bauer-inspired character of Eric Carter, a standout Army Ranger who served in Iraq and is now charged with protecting the country from terrorists. At a time when black actors on television have never been more robust, it shouldn’t be that surprising that the franchise Kiefer Sutherland built would be handed over to a brother. That was not necessarily an intentional move on the part of 24 executive producers Evan Katz and Manny Coto. Although Katz admitted to The Root during aTVfest in Atlanta that “we liked the idea of a diverse character from a very different background from Jack Bauer,” they were not sold on the idea of that character being any particular race or ethnicity. What made Hawkins the guy was purely his presence on the big screen. Katz’s wife, casting director Lisa Miller Katz, saw him as Dr. Dre in Straight Outta Compton when it came out and called from the parking lot proclaiming, “I got your guy. I got your guy. I got your guy,” Evan Katz recalled. He and Coto checked out the film and were sold on Hawkins. Speaking via telephone during a lunch break while filming on a rainy Atlanta day after 24: Legacy’s debut, Hawkins admitted to being a bit apprehensive when 24: Legacy came his way. Although black Twitter has put #BlackBauer into rotation in its jubilation over Hawkins and his character, he is very firm that Carter is not quite that. “He really is a different person,” Hawkins explained. “He’s a younger guy who has grown up a different way. He doesn’t have kids. He’s not a CTU agent, so he’s not used to a lot of things. He might mess some things up. He might get some things wrong. He might get some things right in this first iteration of it. Another thing that’s different is that Hawkins’ Carter is no fly in the buttermilk in 24: Legacy. There are other black people along for the ride, particularly his brother, Isaac, a drug lord, and his wife, Nicole, whom Carter has, in the wake of his unexpected terrorist-fighting mission, sent to Isaac, her ex-boyfriend, for protection. There’s no denying that Hawkins, a Washington, D.C., native and Juilliard grad, is making many smart moves in his career, but he insists that he can’t take all the credit. “I don’t know what’s going on with the projects I’m choosing,” he explained, noting the political timeliness of Straight Outta Compton and now with 24: Legacy. “[Straight Outta Compton] came out while the Black Lives Matter movement was going on, and we were turning on our TVs when we got home from set and seeing riots in the streets and seeing people getting arrested and black men and women being thrown on the ground, which had been going for years and years before,” he said. What won’t change is Hawkins’ willingness to tackle challenging characters. In late April he’s headed back to Broadway in the revival of Six Degrees of Separation, where he stars as Paul, a young black con man who inserts himself into the lives of a wealthy white couple. He’ll also play Houston Brooks, a young geologist and Yale graduate, in the King Kong reboot Kong: Skull Island. And some Walking Dead fans may remember him as Heath, when he donned glasses and delivered far less swagger than Dr. Dre or Eric Carter. 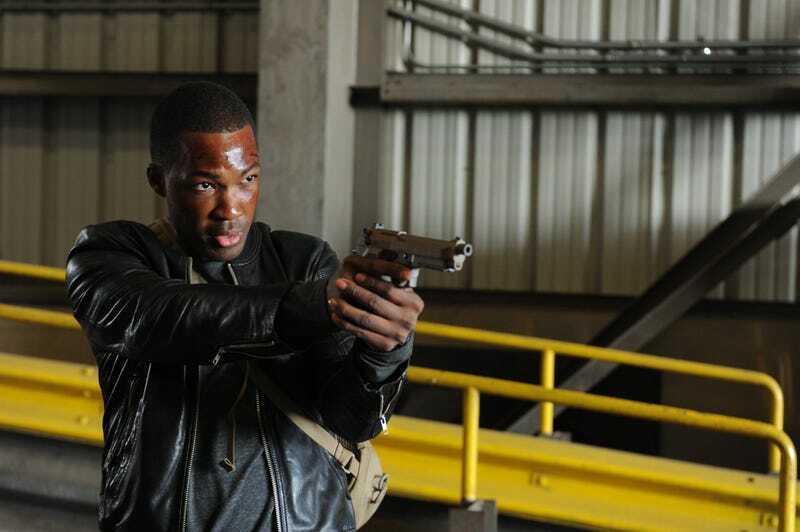 24: Legacy airs Mondays at 8 p.m. ET/7 p.m. CT on Fox.